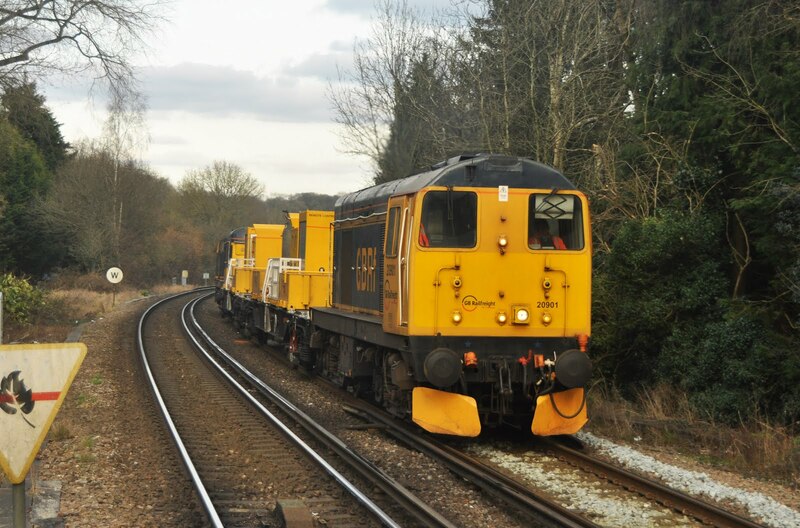 Trains Today: Snow and Ice Treatment Train- with class 20's! Snow and Ice Treatment Train- with class 20's! 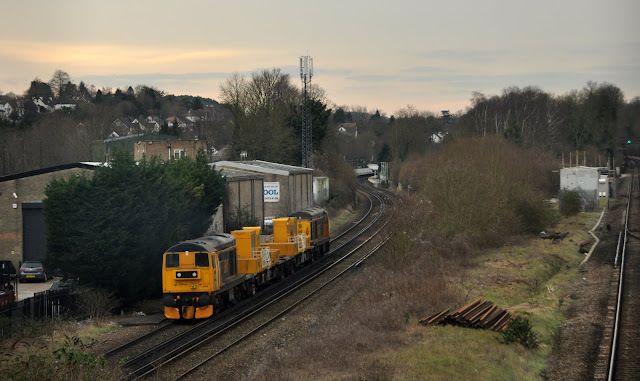 20905 leads the SITT through the reverse curve into Coulsdon Town on the return run from Tattenham Corner. 20901 leads the SITT through Kingswood. 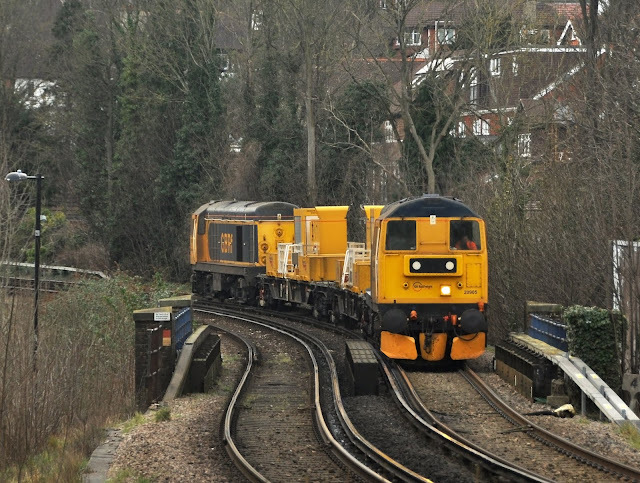 Keeping rails clear and trains running can be a constant battle for Network Rail. Following the heavy snowfall during the winter of 2010 Network Rail invested in some new kit- the 'Snow and Ice Treatment Trains' or SITT. These vehicles treat the rails with hot de-icing fluid and are also fitted with hot air blowers and brushes to scrub and clear snow from the tracks quickly. In addition fixed snow ploughs can be added to the front of the trains to clear larger drifts from the track. Since their comissioning in 2011 the SITT trains have seen little use in anger as a series of particularly cold winters have been followed by some of an unseasonably mild nature. Nether the less it has still been cold enough for frost and ice to build up on rails on occasions and the Kent and Sussex regions of the fromer SR have seen their rails treated with de-icing fluid from the SITT trains. Running as a pair of locos, supplied and crewed by GBRailfreight, sandwiching two SITT wagons the trains have been touring various locations around the network determined by track and weather conditions. The usual traction for the trains has been class 73's of both the original and re-built variety from GBRf's fleet. On occasions Tonbridge based 20901 and 20905 have also got in on the action and it was this pairing that I caught up with on the Tattenham Corner branch on 29th February. 20905 brings up the rear as the SITT approaches Coulsdon South on the final leg of it's duties bound for base at Tonbridge.